Superman and Wonder Woman - Personalized book with your child's name. Become a super hero and join Wonder Woman and Superman in a personalized adventure at the National History Museum. Mister Mxyzptlk, the evil little imp from the Fifth Dimension, was causing trouble at the museum opening. Mister Mxyzptlk was using his magic to make the displays come alive and cause all kinds of trouble. 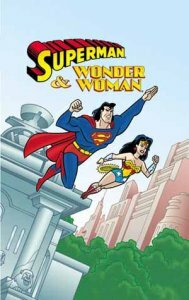 Your child helps Superman and Wonder Woman trick him back to his home in the 5th dimension. Your child saved the day! Great personalized book for adults too! Ryan William Case, age 6, from Ft. Worth, Texas, ran up the steps of the National History Museum. Ryan stopped dead in his tracks. Two huge stone lions were staring hungrily down at him. Just for a second, Ryan thought the lions were real! “I wish Chris, Trevor and Hannah were here with me now,” Ryan said with a smile. “Don't worry, Ryan,” Wonder Woman said with a laugh. “These lions won't hurt you. They're stone. People in Africa carved them 2000 years ago. In the museum's main hall, Ryan saw all the exhibits: dinosaur skeletons and life-sized models of the giant blue whale, the saber-tooth tiger, and the woolly mammoth. Then Ryan saw something very strange. “You're right, Ryan,” Wonder Woman agreed. With all her strength, Wonder Woman lifted the huge animal. All the museum displays had come to life. Stuffed snakes were crawling on the exhibition hall. The dinosaur skeletons were making their way up one corridor and down the next. Suddenly, out of the corner of his eye, Ryan saw a funny little man scurry across the floor and out of the museum. “Superman, look outside!” Ryan called out, pointing to the little man. “Sorry, Supes. You know that's not how it works. I'm not fixing anything until someone makes me say my name backwards,” said Mxy with a laugh. And the little imp winked at Ryan. Suddenly, Ryan heard two blood-curdling roars. The huge stone lions had come alive! People were screaming for help because the lions hadn't eaten in 2000 years. They were very hungry. Ryan sat down and thought. How could he make Mxyzptlk say his own name backwards? Just then, Ryan had an idea. “Well, when I want to have a good time, I hang out with Chris, Trevor, Hannah and Kltpzyxm back in Ft. Worth, Texas,” said Ryan. Ryan looked around. The dinosaurs, the lions, and even the whale - everything was back to normal.